As mentioned before if you are looking for someone to play the put upon everyman, Jason Bateman is your guy. He should have "straight man" embossed on his business cards. He really has that role down pat. Bateman's Max is married to Annie (Rachel McAdams). The husband and wife are deeply in love with each other and with life. However they are also competitive with each other and with their friends. They have weekly game nights-board games, charades, trivia, etc. Despite being happily married Max is not sure he wants to have children with the leggy Annie. It's not that he doesn't like engaging in the necessary act, although perhaps not as much as he used to. Rather it's that Max wants to hold on to his fading youth as much as he can. Given that Bateman is pushing 50 and looks it this is not quite as believable as the writers thought it would be. However it is true that Max doesn't want to invest the time and energy involved in cleaning, caring for, and raising another human being. He'd rather hang out with the couple's friends. These friends include married couple Kevin and Michelle Sterling (Lamorne Morris and Kylie Bunbury), genial idiot Ryan Huddle (Billy Magnussen), and Ryan's would be girlfriend Sarah Darcy (Sharon Hogan). The group used to include Max and Annie's next door neighbor, police officer Gary Kingsbury (Jesse Plemons). 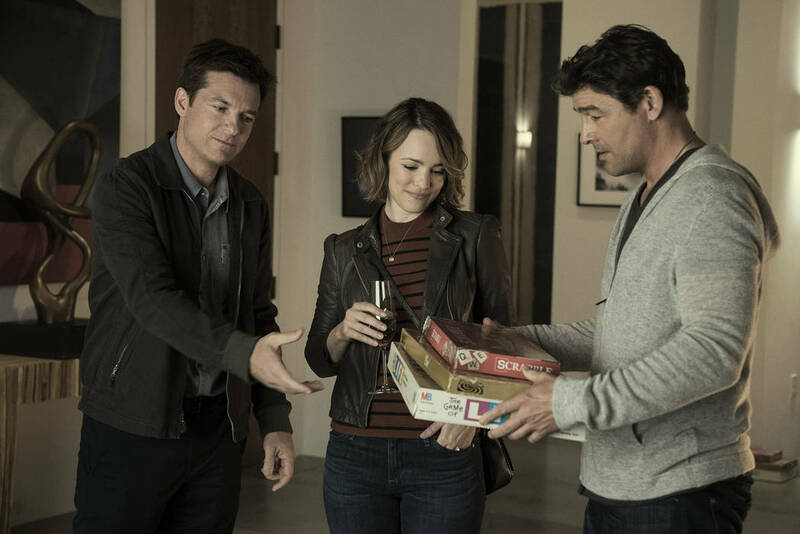 However after Gary's divorce from his wife, he became so very weird and self-pitying that everyone agreed to drop him from game night. But because Gary is large, weird and of course usually armed, the resolutely non-confrontational Max does his best to avoid telling Gary to get lost. Max lies and says that people are over at his house for something besides game night. One person that Max would like to tell to get lost is his pushy unbelievably successful older brother Brooks (Kyle Chandler). A venture capitalist, Brooks has more money than God and doesn't mind showing it. He also doesn't mind sharing embarrassing, even emasculating stories about Max from childhood. Brooks decides that he wants to host game night and show up his little brother. Brooks says that the game will be a kidnap/murder mystery. The guests need to figure out who did it. The winner gets Brooks' Corvette Stingray, which just happens to be Max's dream car. Men break in to the home. They assault and kidnap Brooks. Everyone is impressed with the verisimilitude of the fight and the kidnap. They take notes and hunt for clues after Brooks is gone. However over time some people start to wonder what's part of the game and what's not. Things turn into a wild goose chase with very real dangers. Maybe. This is a 1930s screwball comedy in modern clothing. The movie has a lot of fun in pranking its characters and its viewers. McAdams and especially Plemons almost steal the movie, but every character gets a chance to shine. There is some violence but this is not a brutal or super serious movie. It reminded me of Clue in that there are multiple reveals. Good fun that doesn't overstay its welcome.